The Snow Sweeper was built for the East Side Railway, which ran to Oregon City. This was the first interurban line in the country. 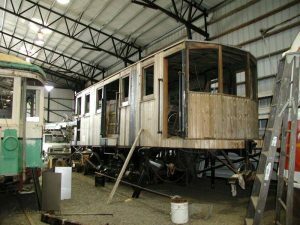 In 1902 the line and equipment were transferred to the Oregon Water Power and Railway, and the car was numbered 102. 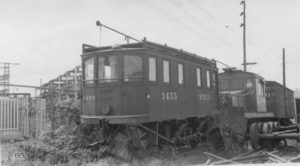 In 1906, the Portland Railway Light and Power Company renumbered the car as 1455. 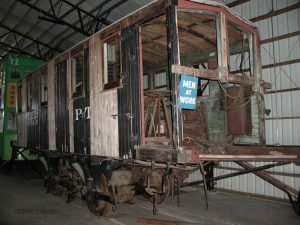 Later, the Portland Traction Company added a work platform to enable the car to be used in overhead line repairs. Also known as “The Broom”, 1455 was last used for snow removal in January 1954. After the end of electric passenger service, and the conversion of the line to diesel power, the sweeper was donated to the City of Portland for a proposed rail museum near Oaks Park. It sat for years on a siding with other equipment, exposed to the weather and vandals, until an arrangement was made to bring it to the Trolley Park. Last Operator: East Side Railway Co.